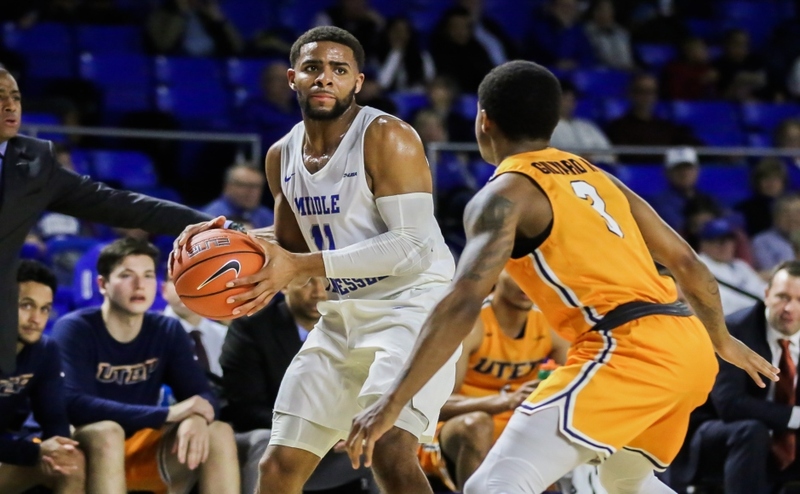 Ignited by 10 first half three-pointers, the Middle Tennessee State Blue Raiders (4-14, 1-4) knocked off the UTSA Roadrunners (10-8, 4-1) by a score of 89-86 on Thursday night at the Murphy Center to give them their first victory since Nov. 16, 2018. Reigning C-USA freshman of the year Jhivvan Jackson knocked down his first three-point attempt of the game, but that was the only lead his Roadrunners could muster against MTSU. 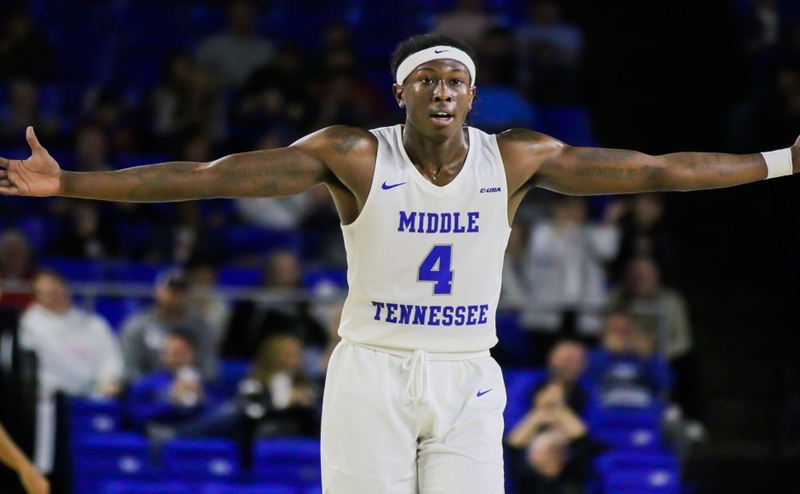 Donovan Sims and Antonio Green responded with three’s of their own and previewed what turned out to be an electric shooting half that saw the Blue Raiders knock down 10 first half shots from behind the arc. Nine of those three’s came from Green, Sims and senior forward James Hawthorne. 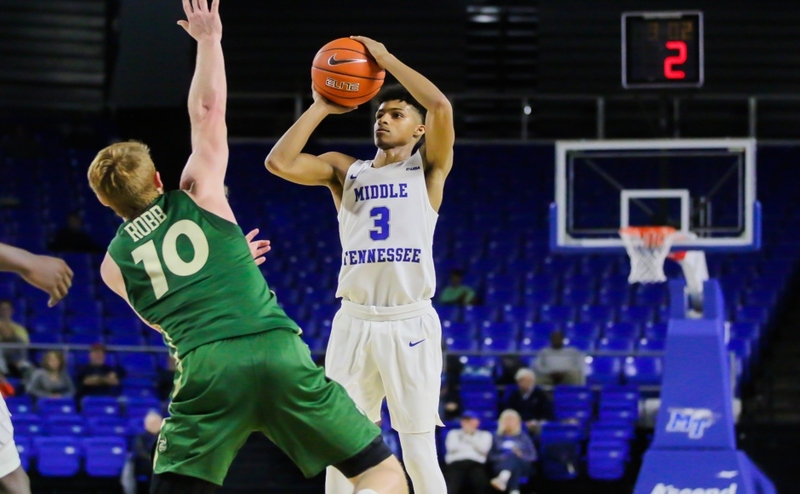 The hot shooting helped the Blue Raiders open up a lead as large as 19 when Sims knocked down a three-pointer from the wing to give the Blue Raiders a 37-18 advantage. UTSA chopped the lead down to 12 with a minute left until halftime, but Green’s floater from outside the paint banked in off the backboard as the buzzer sounded to give MTSU a 45-31 cushion going into the second frame. The Blue Raiders stretched the lead back to 19 after three Sims free throws, but UTSA did not go away that easily. Over the next three minutes, the Roadrunners embarked on a 9-0 run that cut the Blue Raider advantage to only 10 with 15 minutes left to play. 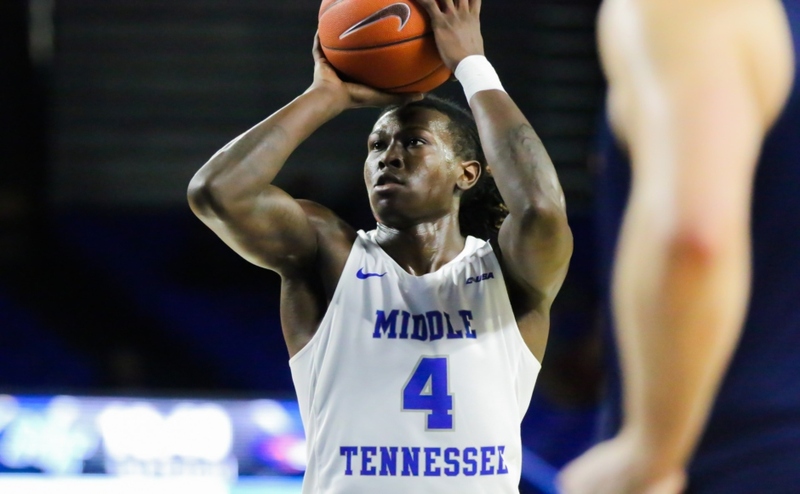 MTSU responded by going on a 17-5 run of their own that was capped off by one of Hawthorne’s career-high five three-pointers to give them a 67-46 advantage with 10:16 remaining. The Blue Raiders kept a double-digit lead for most of the second half until UTSA crept their way back within two possessions when Roadrunner guard and C-USA leading three-point shooter Keaton Wallace drilled two straight shots from behind the arc to pull his team within five points with only 1:06 remaining. While Jackson knocked down multiple three-pointers in the final minute, timely free throws from Sims, Green, Junior Farquhar and Karl Gamble helped keep the Roadrunners at arms length. 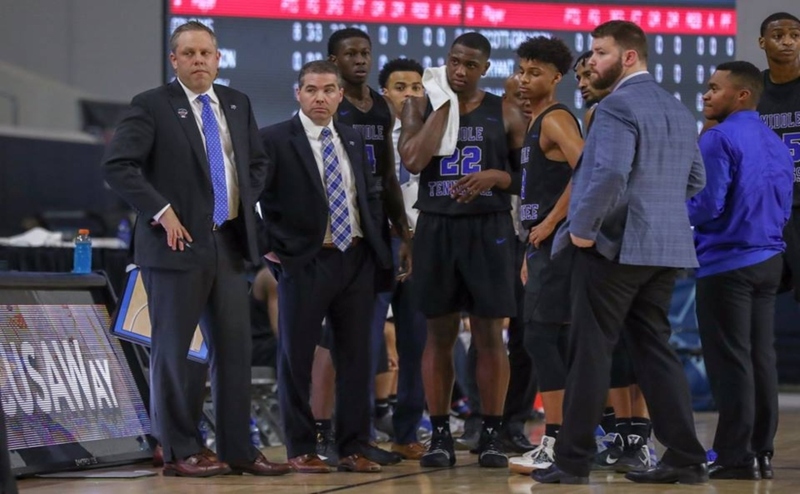 Jackson’s desperation heave at the buzzer swished through the rim, but it was not enough as the Blue Raiders escaped with their first win of the conference season. Sims led the way for the Blue Raiders with 24 points on the night. 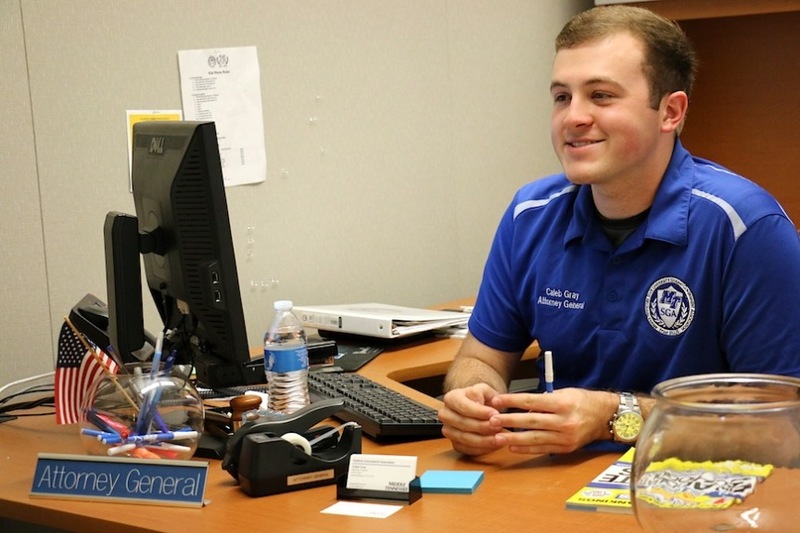 However, Sims wasn’t the only Blue Raider to put up at least 20 points on Thursday night. Green scored 21, and Hawthorne pitched in with a career-high 20. Thursday night was the first time since Jan. 31, 2002, that three Blue Raiders scored more than 20 points in the same game. After posting a career-high 28 points against Southern Miss last week, Sims put up 24 points on 5-11 shooting to go along with six assists and five rebounds. According to Sims, the recent surge in offensive production and aggressiveness comes from the encouragement provided by coach Nick McDevitt. The win against UTSA marks the first win for the Blue Raiders since their 76-73 win over Charleston Southern on Nov. 16, 2018, as well as marks the first C-USA win since McDevitt took over as head coach. The Blue Raiders look to win their second straight C-USA matchup on Saturday night at 5 p.m. against the UTEP Miners. UTEP is currently 1-4 in C-USA play and is coming off of a 76-63 loss at UAB on Thursday night.